Light the candles and set the mood! 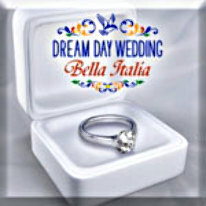 Your flourishing business is taking you overseas to orchestrate the flawless wedding details for a bellissimo couple. From the perfect proposal to cutting of the cake, bring this charming adventure to life. Uncover hidden items, visit famous Italian landmarks, explore historic works of art, and restore tender memories. Sixth in the Dream Day series, Bella Italia delivers more exquisite adventure by taking you abroad for the very first time! Explore the beauty of Florence and an enchanting family villa in the Tuscan countryside. Immerse yourself in amore as you find over 3000 items to create the romance of a lifetime.